As the first part of a series to explore the famous roads of cycling, here is the Alpe d’Huez in France. The idea with this weekly series is to discover the road and its place in the world, whether its part in cycling’s folklore or to explore what it is like on a normal day without a race. Alpe d’Huez is first as it’s one of road cycling’s most famous routes, an Alpine theatre that has become famous and even had books written about it. Next summer the Tour will climb the road twice in one day. But for all its fame, this is a new climb that only gained in notoriety during the 1980s where began to feature almost annually on the Tour’s route. The D211 road climbs out of Bourg d’Oisans to the ski resort of Alpe d’Huez at 1,860 metres above sea level. It is 13.2km long with an average gradient of 8.1% making it a tough climb but the road is wide, well-surfaced and a work of engineering that tames the mountain. Much of the engineered sensation comes from the famous 21 hairpin bends. A typical bend in the mountains sees the inside of the road rise up so steeply that most cyclists avoid cutting the apex when climbing so as not to stall. But the road to the Alpe has many flat and wide bends to allow even the largest of vehicles to corner with ease. Everyone says the climb has 21 hairpins which is correct if you stop upon entering the ski resort of Alpe d’Huez only few stop at the sign. This means there are more bends to climb. It’s not necessarily the most beautiful climb. The road climbs up some steep slopes where it flanked by steep concrete walls on one side which radiate heat back to the riders on a hot day, the green pastures only emerge at the end. But there are good views of the Romanche valley. You can count the hairpins and measure the gradient but roads often have an unquantifiable feeling. This is a busy road that has been designed by civil engineers and without a race the climb feels functional. There’s none of the ersatz spiritualism of Mont Ventoux nor is it the toughest of climbs – there are harder roads nearby. The climb starts steep, going from flat road to a 10% grade in an instant, big ring to inner ring in a click. The best part is the middle section, with elevation a rider can gaze at the valley below but also spot the road snaking ominously above. Unlike other Alpine roads this does not meander up a valley, following the natural course of a river. Instead this is a supersize parking garage with 21 levels connected by a series of ramps. It’s rural but there’s a mild suburban vibe with the street furniture, the concrete wall and crash barriers that line much of the road. As the top approaches the ski resort and its ugly constructions detract from the mountains around. Scanning the photo archives, there are few scenic photos, instead the focus is on the action and also the dense crowds which part to let the leaders pass although perhaps this is because most photographers don’t have the time to compose a shot since they need to get to the finish to capture the winning moment. The village of Huez sits about halfway up the climb and has long been inhabited, perching on the slopes. But higher up the open pastures were used for grazing cattle. At one time a silver mine was operated for the benefit of the local royalty and protected by the Chateau de Brandes. The fort has crumbled now the mine has gone. Instead the place earns its coin from tourism and in the 1920s winter sports became a leisure activity and the ski resort began to take shape. If others invented the ski lift by accident, for example to transport goods up the mountain by sliding sacks uphill over the snow, Alpe d’Huez claims it was the first to install a formal ski lift. The nearby Galibier pass was first included in 1911 but the Tour did not climb the Alpe until 1952 when it was used for the race’s first ever summit finish. Fausto Coppi won. It was not until 1976 that the race returned meaning the road is a relic of the modern era as it established itself as a regular summit finish in the 1980s and 1990s. This suggests the sport’s pantheon of legendary venues can be opened up to include new places with relative ease. The Dutch left their mark with wins two stage victories each for Joop Zootemelk, Hennie Kuiper and Peter Winnen in the 1970s and 80s, along with Steven Rooks and Gert-Jan Theunisse. To this day the place is a big draw with the Dutch in summer and winter alike. The resort has made up for lost time and embraced cycling. Each hairpin bend is named after a Tour stage winner but given the race has visited so often now some corners now have two names… although the local council is set to delete Lance Armstrong. But if the hairpins are numbered this owes little to the Tour: the bends were numbered to help snow plough drivers in heavy snowfall. So what’s it like when the crowds are gone? Well it’s busy, at least for an Alpine road. The road is open all year as the ski resort requires easy access. Grenoble is the nearest city with rail connections from Paris and both Lyon and Geneva airports are not far. The only public transport is a bus to Bourg d’Oisans. You can stay in Alpe d’Huez but like many purpose-built ski resorts, it looks better when buried under the snow and its charm melts with the snow. Down below Bourg d’Oisans makes a better base with a range of family-run hotels. As well as ascending the main road via Huez and the back route via the Col de Sarenne there is a third route up via the village of Villard-Reculas. There are also many other cols in the area that have been used by the Tour de France, from giants like the Galibier via the Lautaret and the Glandon and Croix de Fer sisters, all of which tend to be open from May until October. The most famous climb of the Tour de France? Perhaps but the Alps have plenty more to offer. The wide road and regular gradient make it a hard climb but it’s a steady ramp test, there are no nasty surprises. It’s more access road than mountain pass, and if it’s no Alpine highway, there can be enough traffic to ensure the mountain air has a diesel tang. This is a road brought to life by racing and in fact it is a relatively recent edition to the sport. It is worth trying on a visit to the Alps but nearby roads offer a more typical Alpine experience of high altitude, green pastures and open space. There’s also the route via Villard Reculas which spits you out at Huez about two-thirds of the way up the famous hairpins. A much quieter and more scenic climb – in particular the corniche road from Villard round to Huez with views over the Romanche valley. Sure you know this but others might be interested if they are in this part of the world. I cycled up the Col de Sarenne and back down alpe d’heuz this summer, would recommend it to anyone. Once you reach the summit the views across to deux alps and down the valley to bourg are amazing. The roads will definitely need to be resurfaced for the tour and i imagine someone like Nibali could gain a few seconds on the descent. Excellent video on http://www.grenoblecycling.com/ stroll down to October. Also good site for any rides around Grenoble including the Villard Reculas as mentioned above. Took this photo at the start of the descent down the Sarenne. In Holland this climb is also known because it is the scene for the annual Alpe d’HuZes event. Participants collect donations from family, friends, and collegues for their climbs up the mountain. The name is a play on words. ‘Zes’ means six, the amount of times the participants climb the mountain (though it is allowed / common to climb it fewer times). The donations are used for a foundation for cancer research. Last year the 8000 (!) participants raised more than 32 million euros. Thanks for bringing this Event to the attention of ALL ! Last two years i have left the ” Dauphinee Libere ” to ride this EVENT ! 2010 on the thursday and 2011 on both wednesday & thursday , with each day starting around 6am . As the days progressed , the road became a carpet of people , with walkers and Cyclists on ALL types of bikes . Notable were the ” Hand Bikers ” , some of whom , managed the climb 3 times in the same day ! Certainly a courageous effort , most were accompanied by numerous members of their Club or support team . Would be great to see British & Aussie Handbikers being assisted to attend this WORTHY event . 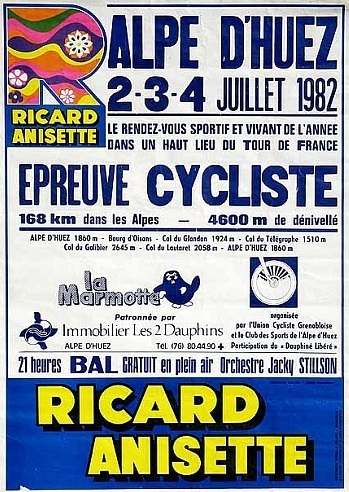 Great article (as always) but la Marmotte isn’t the first GranFondo/Sportive by far. I would put my 2 cents on the Nove Colli (Cesenatico) Italy, that had it’s 42nd (or 43rd) edition this year. Contrary to your view, I find the middle section the worst part of the climb. Not much to look at and the distances between the bends are quite uniform. I love the first 4 bends as they test your spirit… ‘surely it can’t all be like this!’. The distance and gradient of the first couple of turns is awful. Finally, as an amateur, when you get to the natural amphitheatre in the final 5 turns, you finally get to imagine what it must be like on race day. The sky opens up and you can see the road snaking to the town. Looking down on riders below gives you a little kick to make sure you keep your position. Everyone is now going to give your their 2 cents worth now so here’s mine. The ride from Bourg D’oisans to the Croix de Fer has got the lot. Wooded valleys, nasty surprises (that downhill section), an alpine meadow, marmots, alpine lakes and stunning lookouts. You do get some heigh early with the first few ramps and bends. Yeah, I agree, that ride up to Glandon/Croix de Fer from the Bourg side is awesome. Last September we left Alpe D’Huez in the rain and rode up to Glandon. The rain made it especially eerie and it started snowing with about 500m vertical to go, which was fine until the little descent near the end which was so cold! The little café (Le Chal de Glandon) just before the top of Glandon couldn’t come quickly enough and the lady who runs it was on fine form as we all waited for the snow to let up. I agree with MT, as far as climb go in that region Croix de Fer is a far better climb. It might not have the intrigue that AdH does but it has everything else. And that downhill section was definitely most unexpected! The article says the road condition is excellent but when I did it (late Aug 2012) I found it rough and riddled with pot holes. Then there is the choking exhaust fumes of the constant traffic going by. If you can do the climb as part of an event or when they limit traffic for the timed runs on Wednesday, then I’d recommend that. If it is rough it should be repaired soon. We can expect smooth surfaces for next summer although budget cutbacks across France mean rougher roads are likely as towns and regions try to mend and make do. Nice feature, great idea for the off-season. Feel free to email me if you’d like any first-hand details on climbs in Italy. My first visit to the Alpe was in the late 80’s when it had a very different feel and vibe from what it’s like now. Used to be DEAD there in the summer unless Le Beeg Shew was in town. Haven’t been there in probably 5-6 years but even then it was a commercial scene with seemingly every bike tour operation running support vehicles up and down, photographers shooting photos of the thousands cycling up and plenty of cheap eateries catering to the tourists. Some would call this progress..but I’m not so sure it’s an improvement. I’m happy there are no climbs in Italy that have suffered this fate (so far) though Passo Stelvio on a summer Sunday is busy enough that we changed our Legendary Climbs itinerary to do it on Monday. Happy New Year to all! As a former co-driver we not only got the chance to use the famous roads out of competition, it was almost compulsory. Col de Turini means even more to a rally driver than cyclist! Some advice – I have January off and would like to ride a bike for a week somewhere challenging but not cold – any good suggestions? Another excellent post. I would add that after that first stiff kilometer, settling into a tempo makes the climb seem easier. Problems start when accelerations from the group start, and the steady tempo has to be changed. Not so easy then ! I’ve climbed the Alpe a couple of times, the last in 2010 as part of the Etape. On it’s own it’s a good climb if tackled at the right time of day (for the aforementioned traffic and also for temperature reasons) and with the clearly delineated start and finish lines it’s always a good challenge to compare your times to previous marks (your own and others). Definitely worth the trip to ride it, although there are others in the area that are more worthy – CdF and Galibier spring to mind. One observation, after the Etape we dropped over the Sarenne and stayed in a hamlet in the adjacent valley. It should be a great climb to the top from the Alpe and the descent should be…interesting…but they will need to resurface the road as its pretty ropey to say the least. In a number of places there are drainage culverts that run across the road surface leading to a sharp drop of 12-18″ and a rough scoured area. It was slow first gear work in a car and if you hit those at speed on a bike you’d be doing a John Lee Augustyn over the side. If Nibbles wants to pull time out on the descents this year, this is one stage he’ll need to scout in advance. A small detail, but the chairlift was first invented and built in Sun Valley, Idaho in 1937, and patented by Union Pacific, while the first European chairlift was built in 1940 in the Czech Republic. The design was based on the systems used to load banana boats. The first chairlift, on Proctor Mountain, still stands. I’ve ridden the Marmotte, and it’s certainly a Bucket List item. Amazing experience. The climb did not strike me as difficult as I expected, and my strongest memory is the heat radiating off the retaining walls. It was like riding past an open oven door. It wasn’t a chair but the button or platter lift. Great article – your description of the climb is spot on, although lacking some of the romanticism and nostalgia you evidently feel when climbing the famous mountain. Without doubt, the first section is the worst. Thankfully the gradient does become more consistent on the way up! For a bit of history, visit the cycling shop in the village – they’re a trek dealer and have one of lance’s bikes (not sure if it will still be there now!) as well as one of Spartacus’ from this years tour. I think this is a less romantic road, an access road. Still a good experience but other roads have their romance. Maybe I should score each road for romance, challenge, beauty and historical significance? If I did it would rate lower on romance but it is still good. The notoriety alone means many cyclists ride up so it is good to meet others and see so many enjoying the experience. I must say, i found it more ‘romantic’ than say Ventoux, which is as much a mental test as it is physical (at least d’Huez has a view!). By far the most challenging for me was the Galibier, although i attribute that to the change in conditions on the way up more than anything else – it went from mid teens at the bottom to sub zero at the top and this was in September. You could cover each topic as you mostly have above and then rate it….although you may be opening a can of worms there! Ride up on my motorbike in 2011, full of lorries, and the stench of exhaust fumes and diesel as previously described. Visiting for the stage this year. On our motorbikes again, anyone any ideas what time we’ll to get there to ride up and find a spot? I think that the peleton will hammer down a little quicker than we did though. there are some pics of it here if you’d like something to whet your appetite. You can see that it could do with resurfacing but it is a quiet road, when we rode down it we only saw one car all the way to the lake at the bottom. Are all French ski facilities ugly? Never been to Alpe D’Huez, but the ski station at La Mongie (on the Tourmalet) is ugly as sin and would be improved greatly if somebody ran a bulldozer through the lot and started again. Must drive the Tour photographers nuts trying to compose shots that minimize the visual impact of it. A lot of big resorts are ugly. The placesbwhich are natural villages can have their charm as long as the place is not too big. But the snow often hides the concrete meaning most visitors don’t notice. Go in summer and the cyclists see it. Fortunately the mountains and valleys compensate. Great piece! Another storied moment: Giuseppe Guerini’s dramatic stage win in 1999 when he ran into the photographer who had stepped into the road. On the 2006 Etape du Tour it was 42C at the bottom. It seemed to get even hotter on the way up as the heat radiated from the rock face and the concrete. One resident, around a third of the way up, close to Huez, had fixed up a lawn water spray affair so that it scattered a delicious, refreshing mini-shower on to the sweating hordes below. A marvellous moment on a tough climb on a hot, hot day. I shall member it as long as I live. Cycled up it 20 times! I love that mountain – the first 3 turns almost kill me and then I get into the rhythm and I am off! Worse climb for me? Ventoux! I bailed my first attempt and tried again the following year and did it but never again. 2nd fave climb is Tourmalet – nice cafe at the top! Agree, lots of fun stuff beyond Alpe d’Huez in the region. 2100 metres at Col – fully paved but the road ends there. Steep, beautiful and deserted road. Start at Rochetaillé, head to Vaujany ski station, and just keep going. Great views of Lac de Grand Maison from summit. Also, I’d suggest to anyone climbing the classic route up to Alpe d’Huez that after they take the obligatory Podium photo at the finish, to continue leisurely on. The rough but paved road will take you on a short few kilometre extension up to Col de Poutran and then to the beautiful little Lac de Besson (approx 2100 metres). Stunning views. Perfect for celebration lunch. 2nd the col du sabot, did it one summer evening with no one around, views amazing. The climb to Vaujany is also a tough one. Great info. Sabot means a wooden shoe, I wonder where the name came from? Personally, and only personally, I think the worst 2000+ metre climb in France may be from Bourg d’Oisans to Col du Lautaret. I often see miserable tour groups climbing it as they have done Alpe d’Huez and want to visit Galibier. But there are 10 or so tunnels, a few very long, dark, uphill, and wet. And it is a main through road with trucks and traffic. Add the construction everywhere this year and in my opinion it is to be avoided by everyone except the strong and un-fussy. For weak climbers it is pure hell. It is bad enough descending, but climbing? Lautaret is beautiful, and the turn off up the south side of Galibier is a fantastic 8,5 km stretch. If your hotel is in Bourg and you need to see Galibier, I’d suggest using a car to get above the worst tunnels – and starting a little above the dam/lake. Com’on Will! Descending that road from the Lautaret to Bourg d’Oisans is quite fun. Riding in that direction the few motorists don’t disturb too much. They have about the same speed and those who don’t can be overtaken at a lot of places. But I agree that climbing up to the Lautaret is less recommendable. yes, descending is not the worst thing in the world, but still not great. Yes, it is a big artery. As a rule visitors to France should get a Michelin map or see viamichelin.fr for online maps and avoid the red roads where possible as the traffic is heavy. Worse with then Lautaret is the wind, it can be calm elsewhere but a headwind appears here, often in the afternoon. Sorry about this article (link below) in French (may Google Translate or Bing could help) just to let readers know not everybody’s happy with the new TdF route around L’Alpe. Happy new year, big thanks inring for your hard work. Always good. A great piece. Totally agree; it is a utilitarian climb with an ugly resort as a finishing reward (yes, almost all French ski resorts ARE ugly). But the climb does have history. In spades. Almost all the road painting has gone now (I was up there yesterday), but come the summer it will be ful of colour once again. AND, being south facing it does get a lot of sun, so it is rideable all winter (so long as someone else can drive you back down!). Keep up the great work Mr Ring; you outshine so much of the rest of the mainstream cycling press with ease. Thanks so much for the time you have put into creating such an informed and interesting body of work. I live in the USA and planning to be in France for the 2013 Tour d’France. As an avid cylist I want to climb some of the famous cols. My budget is tight so I am avoidng package tours/deals that would be convenient but costly. Current tentative itinerary would have me in France July 13-23. I would need to rent a bike and again, have someone suggest the best city to fly in to and then rent a car to my destination. I hope this is not too vague but as you can see, I am really just beginning on what I know will be a challenging but rewarding undertaking. All suggestions are welcomed. You can do it all yourself if you plan. Your best bet is to fly into Paris as most transatlantic flights go there and then get a highspeed TGV train to the city of Lyon. From here you could rent a car and then either go to Bourg d’Oisans or Mont Venoux as these places offer great riding and also bike rental. You will need to book the bike rental in advance. Email me if you want more help, contact details at the top of the page. Or fly to Geneva, which is just round the corner. I’m a New England based rider and made a first time visit to the French Alps this past September. In a word, I had a blast. A few teammates and I spent the week with Steve and Anna at http://www.classiccyclingtours.co.uk/ They were perfect hosts at a very favorable price, and I’d go back for a repeat visit with them in a heartbeat. They provide airport transfers, meals, hosting and guiding for the full week and likley could arrange a rental bike. We all took ours over, using Air Canada with just a $50 surcharge when bike box was the primary luggage. Remainder of our gear fit in carry-on. Steva and Anna likely could provide all you need without the rental car charge. 1) I don’t find the Alpe d’Huez ski resort ugly. I think it has a charm of its own and, even in the summer, it seems to have life in it. I think the southern orientation of the mountain gives it a big plus: plenty of sunrise (love it in the very early morning). 2) A big minus for the Alpe d’Huez in pro races is that, although the Glandon and the Galibier are not far, there is still quite a bit of flat in between, enough for pelotons to get organised and steal seconds and minutes from breakaways. This climb hasn’t witnessed the culmination of so many long-range operations. Delgado tried in 1988 and 1990 to attack from the Glandon, only to lose steam in the last 3 kilometers. The best attack is in the first 2 kms, à la Sastre, or right after them, à la Fignon. The Alpe d’Huez dissuades attacking in previous climbs, especially when the closest one (Ornon, the only one not separated by any significant flat stretch) is not very demanding coming from the South. 3) The big plus is that the steepest part is in the beginning of the climb: you are more or less guaranteed to see the field split with 12kms to go, and you don’t usually the group of favourites go up the mountain like a fish-shoal. 4) It’s interesting to note that the Alpe d’Huez features chiefly when the TdF is anticlockwise: the ski resort seems only willing to pay if it’s going to be one of the last & decisive stages. 5) My advice for travellers: stay up in the Alpe 2 or three nights, do the Galibier-CdF-Glandon loops in all three directions, finishing up the station every evening. Accommodation is plentiful in the summer. I’ve done quite a lot of walking in the Oisans, and if you like your mountains rugged they are great. Picturesque, not too crowded, plenty of good refuges, glaciers, lakes etc. The town of Alpe d’Huez is not expecially lovely, but I still intend one day to rent a bike and cycle up there. Thanks for the post, and I look foward to the rest of the series. This may seem somewhat counter-intuitive, but I did the climb on the day before a Tour stage, and also early in the morning on stage day itself, and because the road is already closed to non-official motor traffic, is at least devoid of noise and fumes. Naturally, the place is crawling with fans, but I found them respectful of right-of way and appreciative of one’s efforts (and the climb is plenty hard, at least for this retired racer who had spent a few weeks partying in the South of France prior to Le Tour). Many a giant mug of beer was raised with a toast as I labored past- even not long after sunrise! One very special aspect of this climb on race day is the parade of differently-abled cyclists who arrive prior to the caravan. Picture doing a major alpine climb with one leg. Very inspiring and brought a tear to the eye and a shiver of humanity. Thanks to INRNG for the superb site and to the best, most respectful, intelligent commenters I have observed. Start in Alpe d’Huez and descend the main route towards Bourg d’Oisans. 1/3 of the way down, turn right onto D211B and descend to Villard Reculas. Continue onto D44B. Go left on D44, then D44C, then D526 then D1091, headed back toward Bourg d’Oisans. Go right on D526 and start climbing to Chantelouve. Enjoy the view, then turn around and head back down, turning right onto D210. Climb to Villard Reymond, very small and with a lovely auberge. Some of the TV crews set up communications stations in Villard Reymond to relay signals from Alpe d’Huez’s fireworks to a worldwide TV audience. On the day I rode it, when Bourg d’Oisans and the Alpe were packed, I saw not one single other cyclist up here. Lots of cows, however. Climb through the village to the summit of the col. You are now looking directly across the valley at the entire route of Alpe d’Huez and are, in fact, above all but the top slopes of famed climb, which is pretty cool. 1620 meters for Villard Reymond vs. 1860 meters for Alpe d’Huez. You can see every detail of the 21 switchbacks and, on race day, the faint sounds of the festival below are faintly audible in the mountain air. Now it gets tricky. The “road” turns right and begins to descend on very rough dirt. And when I say rough, I mean really, really rough. Have robust puncture repair stuff with you. Take care for the next 5 km or so, until pavement reappears. Descend very steeply on narrow asphalt to Villard Notre Dame. Take care, it is 15%+, very narrow and ultra windy. Proceed onto D219, Hameux du Creux towards Bourg d’Oisans. This is an amazing descent with enormous rock overhangs and a winding tunnel that goes to absolute complete, pitch black darkness. I got off my bike and walked it down, slowly, through a stretch of this tunnel, not being able to see the hand in front of my face. Bring a small front light and you’ll be fine. Arrive Bourg d’Oisans and proceed up the famed climb to Alpe d’Huez or, if you want to finish off the beaten path, go the back way up to the village by turning right on D1091. At Le Freney d’Oisans, turn left onto D211A and follow the route up to Alpe d’Huez via the Col de Sarennes. I did this route starting very early in the morning on Alpe d’Huez day and it ranks as one of the greatest rides I’ve done anywhere, anytime. Absolute tranquility, pure majesty combined with a re-entry, impressively sudden, to the boisterous roar that accompanies Le Tour’s arrival at one of its most fabled climbs. Another good article, capturing most of the Alpe experience. First did it during the 2011 Alpes Open Tour – Moncutie had showered and changed by the time I got up it after Telegraph and Galibier. Yes, it’s busy in summer but no more so than much of the Alps. The biggest factor in August? Why, 40 degree heat, of course! Melting, grippy tarmac, bottles quaffed in the first 30 minutes, and scary double vision. How much traffic is on the mountain the day before a stage? Is it a crazy dream to run up the mountain then or would it be possible? It’s fine to ride up and you’ll have plenty of encouragement from people camped out as well as others to ride with as many will be staying nearby and doing the same. In fact if you want to ride up, doing it the day before the Tour is as good a time as any.